November 1st is upon us, and it’s time to express some heartfelt gratitude. Believe it or not, number one on my list is the Gutenberg printing press. This invention, which was first put into use in 1450, can be credited with the birth of the modern era, as the Renaissance, Reformation, and Scientific Revolution all have their origins tied to its innovation. 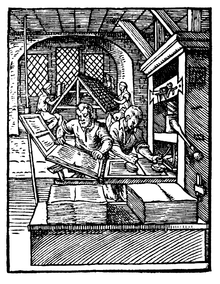 Gutenburg revolutionized the printing industry by mass producing Bibles and Latin grammar primers. He also was involved in printing the indulgences that the Catholic church had started to sell. 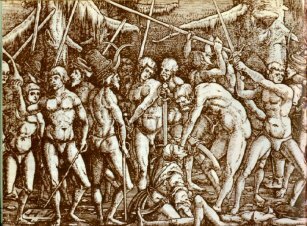 According to Catholic theology, Indulgences were basically sold for full or partial remission of temporal punishment for sins that God already forgiven. Apparently, the early church required that people be punished for their transgressions by some sort of penance here on earth in order to lessen time in purgatory, even though the New Testament indicates that these sins had been paid for by Christ. At some point, these indulgences were sold for the remission of sins, launching one of history’s greatest controversies. Confused? Me too. I bet the people of the day were confused as well. So then, why am I so thankful for this antiquated invention? Well, isn’t it obvious? Here’s a hint. What do the Gutenburg Printing Press, indulgences and November 1st have to do with each other? The Reformation, of course. 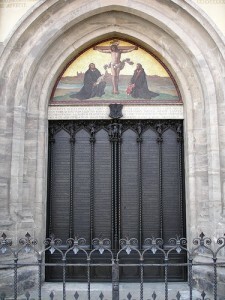 Castle Church doors in Wittenberg, Germany where Luther nailed the 95 Theses. If not for this printing press, the 95 Theses that Martin Luther nailed to the doors of Castle Church in Whittenberg, Germany would not have been the catalyst for the church reforms that swept throughout Europe in the 1500′s. News of what he said spread like wild fire throughout the land. The people listened. Ideas have a way of spurring people to action. Why are these church reforms so important? Primarily, the people found freedom. People were released from the bonds that the clergy had placed upon them. They no longer had to fear punishment, temporal or otherwise, as they were freed from the need for indulgences, for the Bible clearly stated that Christ had paid, once for all, for the sins of those who accepted his death as payment for their sins. The poor were relieved from bearing the burden of excessive spending and blatant extravagance. They found freedom from oppression. What I most love about this movement is that the people were able to get information into their hands and to read it, eventually in their native tongue. Latin was no longer the secret language of the clergy and the wealthy, educated rulers. God’s word and other works were translated into the language of the people. For once, the common, impoverished people had freedom to determine and to decide who and what they believed. The people took action. It was intoxicating. Luther's writings inspired the peasantry of Germany to revolt. Of course, as with any revolution, some took their liberties too far and many people died as a result of civil unrest in Germany as well as in much of Northern Europe, but in the end, the people became enlightened and openly chose what to believe. Many religious, political, economical and social reforms resulted from this movement. Knowledge brought change. Hence, I am thankful for the Gutenberg printing press, and all subsequent means by which the people are freely able to express thoughts, to engage in scholastic undertakings, and to enlighten one another regarding the truth. Thank you, Johannes Gutenberg. Thank you, Martin Luther. Thank you, to the thousands of others, who have gone unnamed and unacknowledged throughout history, but who have contributed to freedom of thought and speech! I am so grateful for your sacrifices. Like in Luther's day, people still revolt against oppressive systems. Brian McClaren and the chamber of secrets!